SUNY Oswego’s annual Media Summits are named in memory of Dr. Lewis B. O’Donnell, professor emeritus of communications studies. “Doc” O’Donnell passed away August 28, 2007, but his influence lives on in the careers of hundred of broadcasters-careers he helped launch. Louis A. Borrelli Jr. ’77 founded the summit through a leadership gift in 2005. In 2007, a significant gift to Oswego made by Al Rocker ’76 of NBC’s “Today” show, including a matching gift from NBC, provided the funding to rename the summit in honor of Dr. O’Donnell’s legacy. Roker’s gift supports the annual media summit, as well as the student television studio in the Marano Campus Center. Louis A. Borrelli Jr. (’77) is a media executive, investor and advisor, successful entrepreneur and recognized industry leader. A pioneer in cable television, online media and broadcast production services, Borrelli has been driving innovation in operations, marketing, business development and new product creation for more than 38 years. Borrelli most recently served as chief development officer for NimbleTV, a cloud-based, advanced digital television platform that enabled portability and unlimited storage to subscription television customers on mobile and connected Internet devices. He joined NimbleTV as an investor and senior advisor to the company in 2011. Borrelli was board chairman of ShowGo.TV (Live music from the coolest places on Earth) and a board member of Piiku.com (Smart Advertising). He was a lead investor and strategic advisor to both companies from 2011 to 2015. 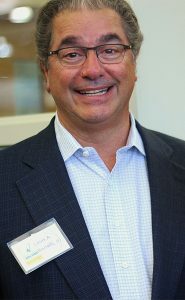 Borrelli was president and chief executive officer of NEP Broadcasting, LLC, the leading international provider of outsourced teleproduction services critical to the delivery of live sports and entertainment events including the Olympics, World Cup and Super Bowl as well as the Oscars, Emmys, Grammys and Golden Globes, The Voice and American Idol. Prior to joining NEP, Borrelli was a senior vice president at America Online Inc., where he developed AOL’s high speed broadband business plan and distribution partnerships across the cable television and telecommunications industries. Borrelli was a founding partner, executive vice president and chief operating officer Marcus Cable Company, L.P. Under his leadership, Marcus Cable grew to become the nation’s largest privately held cable company and was named “Cable Operator of the Year” by Cablevision magazine in 1998. Borrelli began his cable career in 1978 with UA-Columbia Cablevision, holding senior executive positions in programming, marketing, operations and business development. Borrelli has served on several industry boards, including the Sports Broadcasting Hall of Fame, Cable Advertising Bureau, National Academy of Cable Programming, Cable & Telecommunications Association for Marketing (CTAM) and the Metro Cable Marketing Co-Op. Borrelli is a two-time CTAM TAMI award winner (1996 and 2000), received the Pinnacle Award from CTAM Texas in 2001 and was elected to the Cable Pioneers in 2002. He currently serves on the board of Dominique’s Fund for Suicide Prevention as well as the Oswego College Foundation Board and Oswego’s School of Communication, Media and the Arts Advisory Board. In 2005, he established the Dr. Lewis B. O’Donnell Media Summit. He was awarded the Presidential Medal by SUNY Oswego in 2014. The State University of New York trustees bestowed on Borrelli an honorary doctor of humane letters degree in 2015. Al Roker (’76) is a host and weather personality for NBC’s “Today” show. Roker reaches an estimated audience of 32 million viewers every weekday morning as America prepares for work. A 13-time Emmy winner with more than 35 years experience, Roker conducts interviews with celebrities and newsmakers around the world and does a wide variety of segments on every imaginable subject. He is the host of NBC’s annual holiday network specials, such as the Macy’s Thanksgiving Day Parade, the Christmas Tree Lighting at Rockefeller Center, and the Rose Bowl Parade. Roker is also an accomplished television producer. 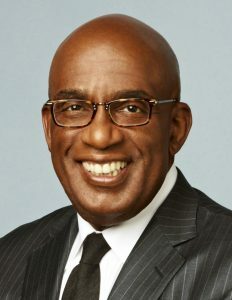 He is CEO of Al Roker Entertainment Inc. (ARE); www.alrokerentertainment.com, a thriving multi-media company involved in the development and production of network, cable and home video. ARE produces programming for a diverse clientele, including NBC News, MSNBC, Spike TV, Lifetime Television, A&E, History Channel, E!, Discovery Networks, PBS, TV ONE, Oxygen, Cartoon Network, Weather Channel, and NBC Television Stations Group. Roker is also a bestselling author with eight acclaimed books to his credit. His most recent title is “The Storm of the Century,” a gripping narrative history recounting the brutal and deadly storm that devastated Galveston, Texas in September 1900. A generous supporter of his alma mater, Roker provided a gift to name the WTOP Al Roker Television Studio and teamed up with Lou Borrelli ’77 to name the annual Media Summit in honor of a mentor, Dr. Lewis B. O’Donnell. He has done live national broadcasts from campus, providing exposure for the college. He earned a bachelor’s degree in communications studies from SUNY Oswego in 1976 and received a SUNY honorary doctorate at Oswego’s 1998 commencement ceremony. Roker lives in Manhattan with his wife, ABC News and “20/20” Correspondent Deborah Roberts, and has two daughters and a son. Born in Syracuse in 1930, Dr. O’Donnell was founding chair of the SUNY Oswego communication studies department and a 26-year employee of the college. A professor of communication studies, he received the SUNY Chancellor’s award for Excellence in Teaching. He was also well known and loved throughout Upstate New York as the character Mr. Trolley on the Syracuse children’s program “The Magic Toyshop.” Dr. O’Donnell moved to Fort Meyer’s Fla., in 1989 after retiring. In Fort Meyers he spent may selfless hours helping others as a volunteer at Lee Memorial Hospital. Dr. O’Donnell received his bachelor’s, master’s and doctoral degrees from Syracuse University. He faithfully served in Korea with the U.S. Army during the Korean War. 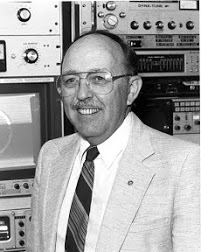 Prior to joining the State University, he spent several years in radio and television broadcasting including stations in Buffalo and Syracuse. Dr. O’Donnell was a role model who had a profound impact upon the lives of his students.